When you’re a food blogger and food is your passion, its pretty difficult to stay away from all those tempting recipes out there in the cyber world and cook books. I get tempted to try out so many recipes and the more calories it has the temptation level is that much higher! Recently I joined this group called Fantastical Food Fight. I got tempted to join after I saw the absolutely tempting cookies made by Karen of Karen’s Kitchen Stories. After I oooooogled at the photos till I was drooling, she suggested that we should check out what other members of the group had made. I scrolled down and recipes had me salivating. Just when I joined, the theme for March happen to be PB&J (peanut butter and jelly).And I thought oh no here goes out the healthy eating… but as I read on further, Sarah Ellis (host of the group) mentioned that peanuts and fruit should be a part of the recipe. Phew!!!!!! I decided to make a super healthy peanut and fruit salad. Blessed with loads of tropical fruits here in Kenya, I used both mango and avocado, along with pomegranate to add a bit of tart taste. I soaked and cooked the peanuts with salt and turmeric powder. As you all know, turmeric powder (haldi) is a must in any Indian’s spice box. Turmeric has been used for centuries in Indian cooking and also as medicine. I remember if any of us had a cut or bruises my mum would apply a paste of turmeric powder. If we had colds and coughs, warm water with turmeric and honey was our medicine. Read the benefits of turmeric here. Soak the peanuts overnight in warm water. Next day drain out the water, wash the peanuts. Drain out the excess water and let the peanuts cool. In the meantime get the other ingredients ready. If you’re using a normal tomato, cut it into half and remove the pulp and seeds.Dice the tomato. Peel and dice the mango and avocado. Sprinkle a bit of lemon juice over the avocado. Put the peanuts, chopped fruits, chopped coriander and spring onion into a big serving bowl. Add remaining salt, chilli flakes, cumin powder and lemon juice. Mix the salad well. Serve as a light meal or as an accompaniment to a main meal. Super healthy and filling. If you don’t like boiled peanuts, use roasted but boiled ones taste much better for this salad. I haven’t used a dressing but you can add a dressing of your choice. For cumin powder, roast the cumin seeds in a pan over low heat, till you get a grassy aroma. Don’t burn them. Cool a bit and powder it in a herb mill or using a rolling pin or a mortar and pestle. I love this salad. Thanks so much for sharing. This salad looks wonderful! Great idea for pb&j! Welcome to the group!!! Excited to see what you will be sharing in the months to come! This month you've blown me away with this super creative idea! YUM! Super creative! What a colorful salad! Thank you Karen, trying to make healthy versions of food this year. Thanks for the warm welcome. Thank you Alicia, looking forward to the themes and being a part of this wonderful group. Its a great meal Rafeeda, try it. Thanks Amrita, try the salad, it is yummy. I'm so glad someone went a savory route. Great recipe and welcome to the “fight”! Thank you Lauren, my hubby and daughter didn't want me to make anything sweet. i love the sound of this salad! so creative! This chaat looks delicious and I love all the combination of ingredients. Since the love of peanuts ride high it is really excitibg to see this recipe. I am so tempted to try ot..will have to wait till i get back. 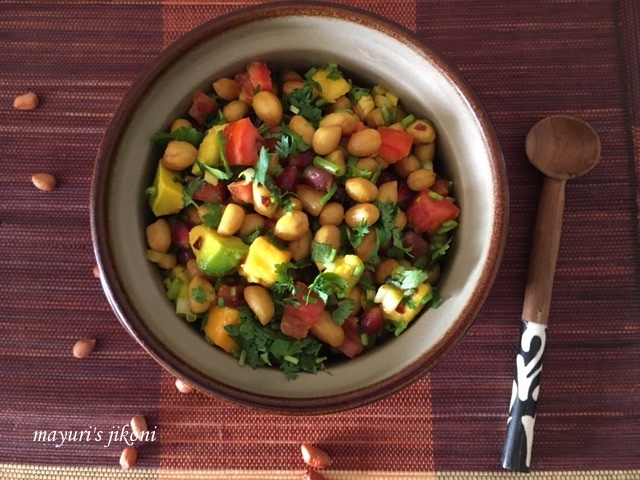 I love peanuts too..especially boiled so this salad or chaat is prepared often.